Previously in everyone’s favorite comic that perfectly mixes Quantum Leap with the X-Men – After defeating the Vampire King, the Exiles were leaping away, when he cast a spell on them. The team got separated, across various dimensions. Maybe this is a better mix of Sliders and X-Men, or a mix of all three. In the previous issue, Sasquatch and Morph ended up in a world where Wolverine had just escaped the Weapon X Program. 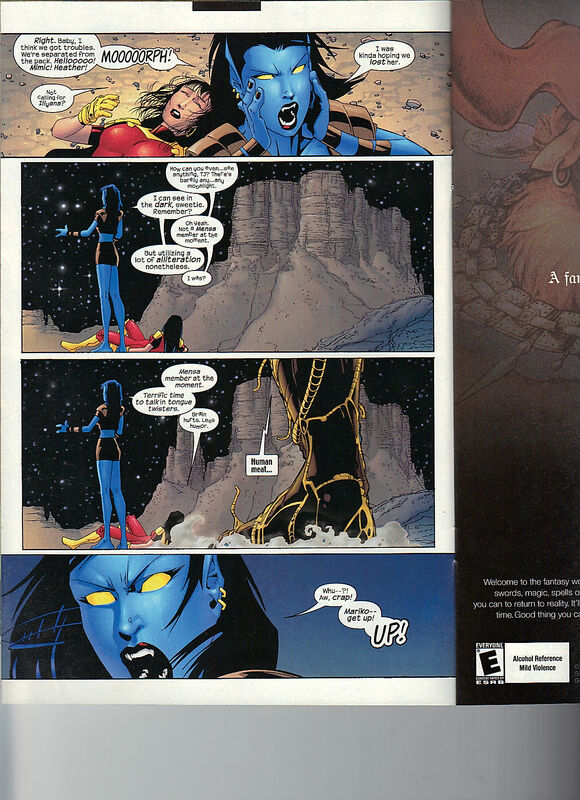 This issue, Nocturne and Sunfire are on the Earth from Exiles 20, 21 and 23. The world overrun by the Vi-Locks. The world wherein the Phanlax came to Earth, took over the heroes of the day and started going after everyone else. 12 Miles Outside of Las Vegas, Nevada. 9:47PM. Nocturne and Sunfire are in the middle of the desert, Mariko is exhausted and completely out of it. It doesn’t take long before Nocturne realizes that they are not near their teammates. TJ shouts for everyone, except for Magik – and Sunfire notices that, immediately. Illyana is a tad intense for this team. Nocturne can see in the dark, but the Vi-Locks come up from behind. Sunfire is able to get it together enough to fly them both out of harm’s way. Unfortunately, Mariko passes out, in mid-flight. 32 hours later. Mariko wakes up and sees TJ and Hank Pym (with a beard!). As they are catching her up, Mary Jane, who is Spider-Woman, jumps into the room. MJ and Mariko had quite the relationship in those few issues. They were not ever expecting to see each other, ever again. 9 Days later. 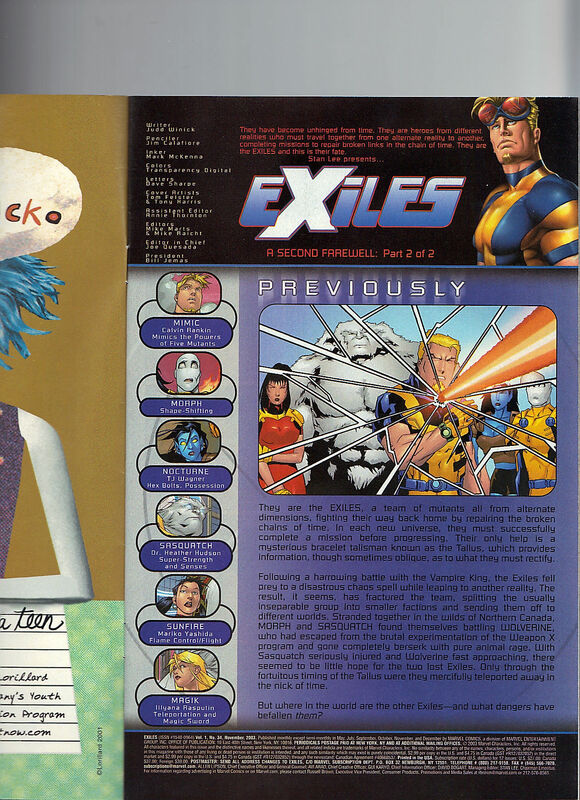 Beast is explaining to TJ that she and Mariko are still emitting their unique signature, that makes them Exiles. Beast theorizes that the two of them could teleport away, at any time. There is a half page ad for Smallville Season One, which was pretty decent. It got much better around seasons three and four. The other half is promoting David Mack’s Ruule, that I’ve never heard of. I couldn’t get into his Kabuki but I dug his Daredevil stints. 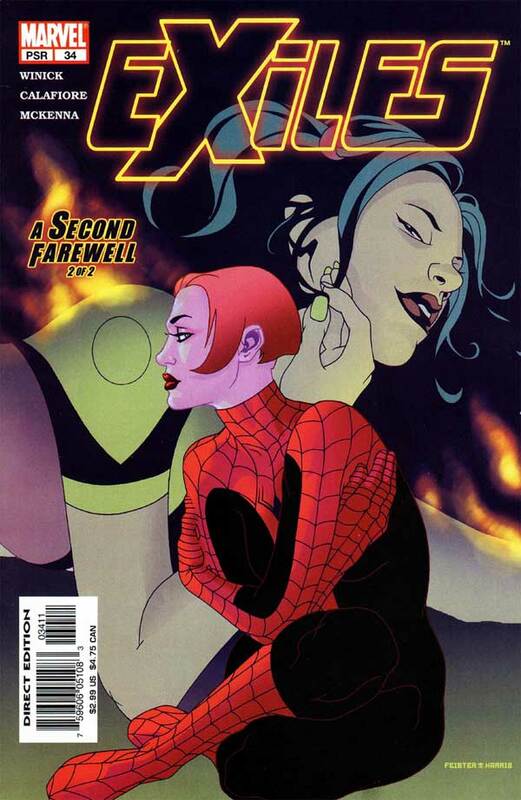 There is a nice scene of Mary Jane and Mariko, discussing when they knew they were lesbians. MJ was always gay, she believes, she had a huge crush on her first grade teacher, and never outgrew those feelings for ladies. Mariko was thirteen, she fell in love with her best friend, but she didn’t return her love. Friendship over. 12 Days Later. TJ and Mariko have joined the team – as if they are never leaving. The team is Thor, a green Juggernaut, Luke Cage as Iron Fist (we’ll see more of him in Exiles Then and Now), Rhino, Longshot and Iceman. 2 Days Later. TJ confronts Mariko about how close she is getting to MJ. She reminds Mariko about how, at one point, they will leap out of here. Which I completely get that Mariko knows that and is wanting to enjoy every minute of this, that she can. MJ overhears this, and starts to get sad. 4 Days Later. MJ and Mariko are in a movie theater, an empty theater. Mariko is trying to enjoy it but MJ is trying to get real. Both of them are going to be hurt, but Mariko doesn’t want to think about that one future day. When Mariko says that this is the happiest she has ever been, she means that. Her own timeline was a horrible place. 13 Days. $ Hours and 33 minutes later. MJ is not happy with a returning Captain America, who is super bossy. They are in the bathroom. MJ is about to shower and Mariko is coming her own hair. While listening to MJ, Marko disappears. MJ, once the bath has filled, comes out and sees the dropped brushed. Issue ends with Beast confirming that they leaped or slid. Mary Jane and Mariko had 41 days together, maybe 42 days.